Like the post title states, this was indeed a happy accident. Last week in our veggie delivery box, we ordered squash blossoms. That in itself was a happy accident, because my mom asked me the day before our order list was emailed if I had ever had them. I said no, and she swore we had to find some at a farmers market, stuff them, and try them. I was estatic when I saw they were available for our delivery. Unfortanutely, we decided not to eat them right away. So when I went to grab them on Monday night, almost a week after they arrived, the flowers were wilted, browning on the ends, and just didn't look appetizing. The problem was I started making the stuffing before I took them from the fridge to exam. I had about a 1/2 cup of ricotta mixed in with some honey and a scrambled egg on the side to use for the breading.... oops. I couldn't toss the ingredients in the trash without a ton of guilt or grief from my trashcan of a husband (seriously, he eats everything!). Not to mention, we buy organic eggs and organic ricotta.... which makes the idea of just tossing good healthy food even more sad. So, like any other Gen Y-er would do, I immediately googled "recipe ricotta honey eggs" and I stumbled across this recipe. Of course, I didn't make that exact recipe (as I already added honey to the ricotta), so here's what I did. 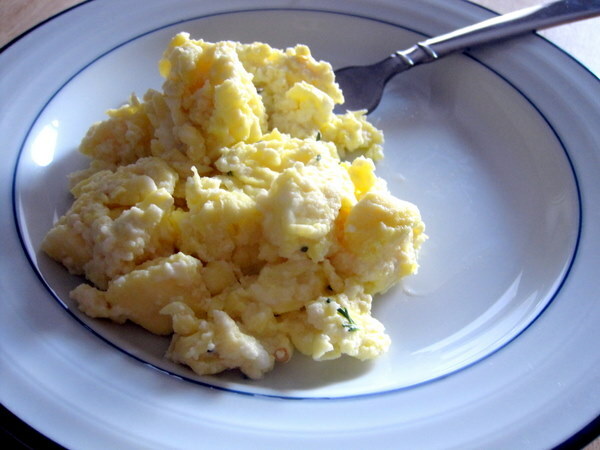 I cracked and scrambled 3 eggs, and started cooking them over low/med heat. Like the recipe linked, I cooked them very slowly. Once they were about 80% cooked, I mixed in my ricotta mixture. I cooked the scrambled eggs and cheese mixture long enough that the extra fluid from the ricotta cooked out. Then I dug in.... then I realized this was so delicious, I had to share the happy accident with you readers! I took a crappy photo mid bite and then went back to chowing down. These scrambled eggs would be a perfect addition to a brunch menu or to surprise your honey with breakfast in bed. If you try them, let me know what you think or any changes you made!